The unique formulation of these precast tris-glycine gels provide protein band visualization in as little as two minutes in the presence of ultraviolet light. 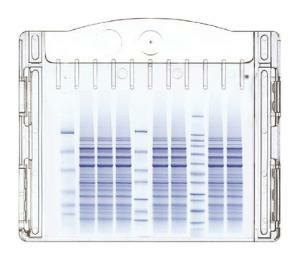 DNA separation is revealed in high resolution with a broad migration range. Quick 30-minute runtimes and a long-lasting 12 month shelf life ensure you'll save both time and money in electrophoresis lab applications.